The sense of censoring mail during wartime is not questionable for the contending parties, not letting the opposite side intercept messages about strategic operations. The inhabitants were informed that it was forbidden to write about war operations in their correspondence. The task to the war censorship was examining mail not letting such information pass. During the 1st Soviet Latvian period when a remarkable part of the Latvian territory was occupied also the Supreme Command of the Red Army established war censorship. However, information about these activities is very scarce, and is based on a very limited number of censored items of mail available. The Soviet Latvian forces consisted of Latvians and Russians, mostly former members of the Imperial Russian army. Mail and documents available from this period is mostly in Russian and this refers also to the censorship markings. It is known that censorship operation spots were established at Rīga and Cēsis (Wenden) due to found items. In Rīga was several different types of censorship markings used. One of the types was a double-oval formed marking with the censor's number in the centre. The upper text means examined but the lower text means military censorship. Known number of censor's is 1, 2, 6, 8, 9,18. A similar marking with the censor's No. 22 is having the lower text "Riga military censorship". 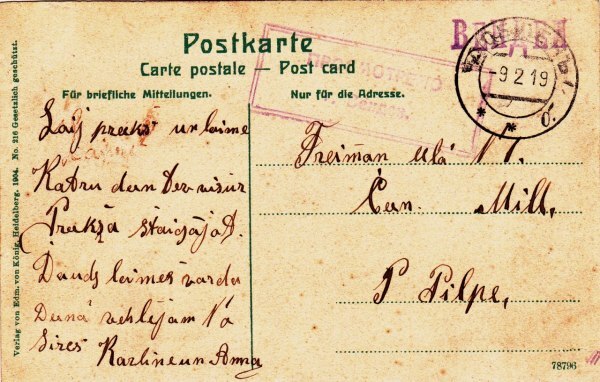 The Soviet Latvian period of Rīga lasted from 03.01.1919 until 22.05.1919 but the main Post Office was opened on January 3, 1919. Registered, letter addressed to Petrograd with the Russian oval censorship marking, Censor No. 2. 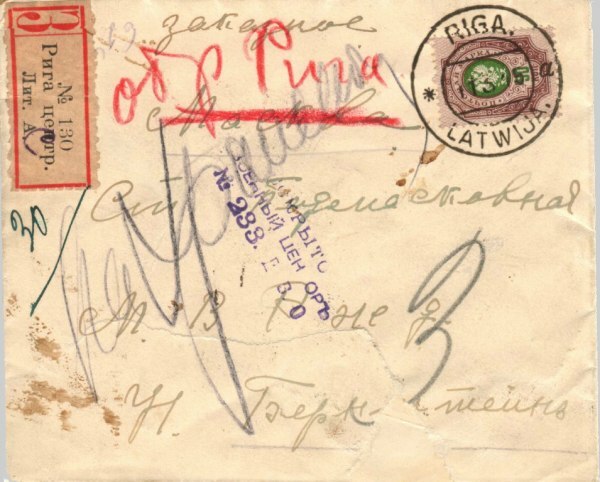 Cancelled Rīga 21.5.1919, one day before the liberation of Rīga. On reverse side there is a hand written note "Atpakal kara apstakhlu dehl" (Returned due to the war circumstances). 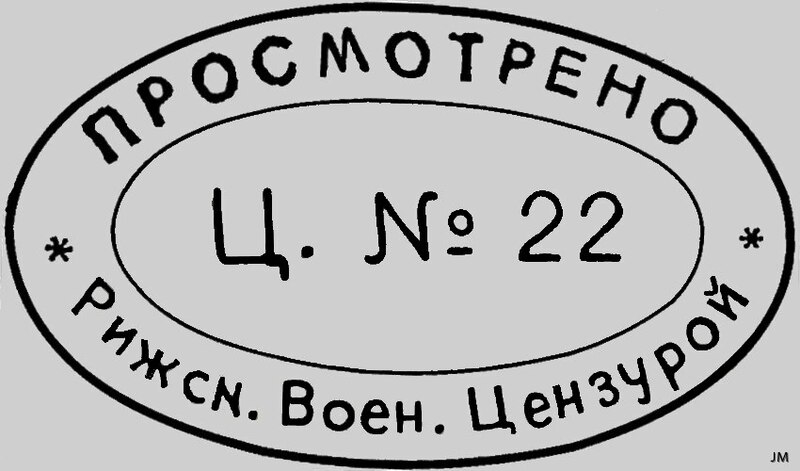 Another type of marking, seeming to be borrowed from the Dvinsk (Daugavpils) Military District but now used at Rīga is a 3-row marking "Opened / Military Censor / 233. D(vinsk) M(ilitary) D(istrict)". 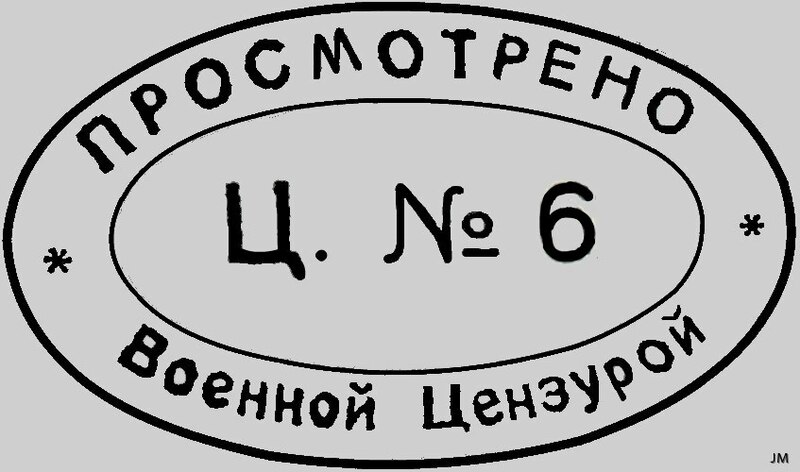 This marking was during 1917 former used at Daugavpils by the Dvinsk Military District censor's. 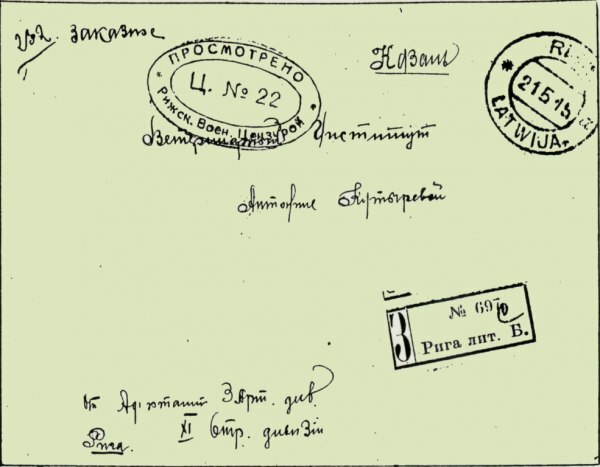 Registered letter sent to a hospital in Moscow, cancelled RIGA a 11 3 19 and with the censorship marking No. 233 of Dvinsk Military District, most likely used in Rīga. 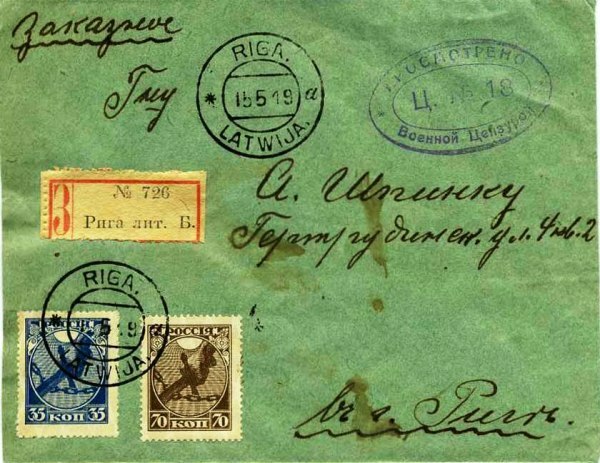 The letter reached Moscow on 16.3.1919 (arrival postmark on reverse side) but due to that the addressee couldn't be found the letter was returned and arrived at Rīga again 12.4.1919 (arrival postmark on reverse side). Boxed censorship marking "examined / (T)own Wenden" of Cēsis (Wenden) known 17.01.1919 – 27.03.1919. The Soviet Latvian period of Cēsis lasted from 23.12.1918 until 31.05.1919 but the post office was opened on January 4, 1919. 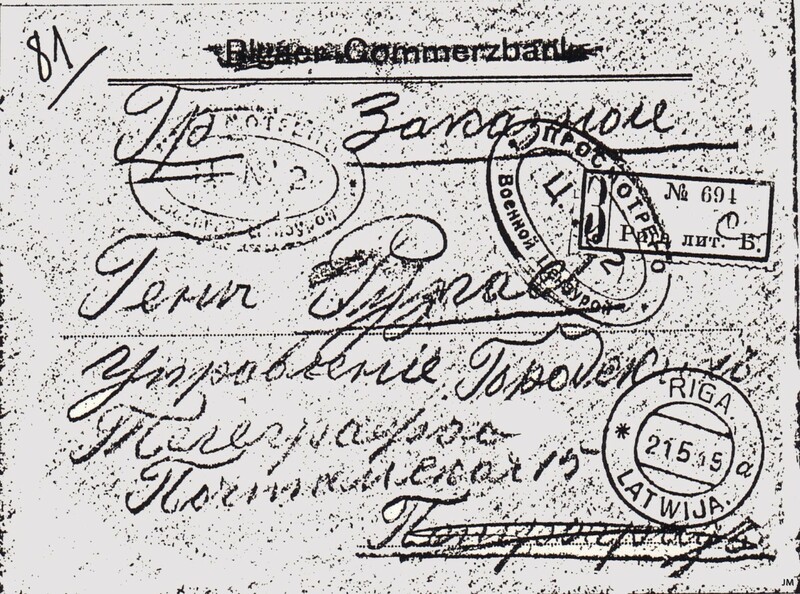 Boxed Russian censorship marking of Cēsis (Wenden), cancelled with a provisional Russian single line marking "WENDEN" and also a partly mute Russian postmark ДОБЛЕНЪ (Doblen / Dobele) -9 2 19, used in Cēsis. This postmark is a remainder from 1915 when the Russian Dobele post office was evacuated to Cēsis.